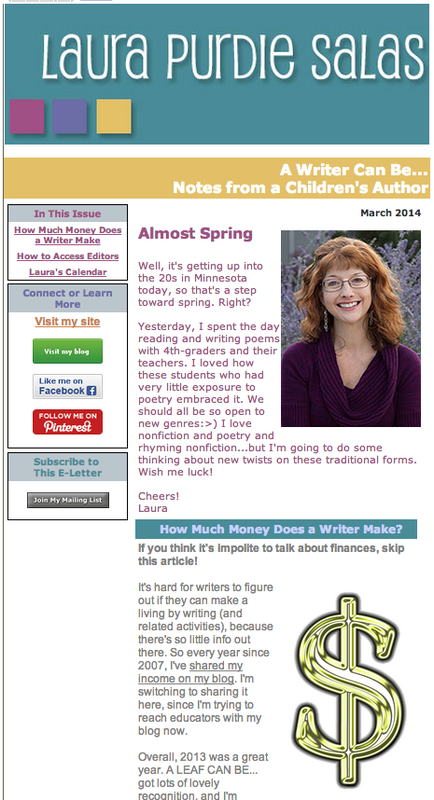 In Laura's recent newsletter, she included an article "How Much Money Does a Writer Make?" in which she lays out (full disclosure!) her income from last year. It's a remarkably brave thing to do. We are so quick in our culture to reduce and judge a person's success - and a career's success - in financial terms only. Because of this, and perhaps because of, as Laura says, a sense that talking about money is "impolite," the real nuts-and-bolts of HOW a writer's income can all come together (or not come together) doesn't often get discussed. So it's very instructive to see how all the different financial career elements come together for her. If you think it's impolite to talk about finances, skip this article! It's hard for writers to figure out if they can make a living by writing (and related activities), because there's so little info out there. So every year since 2007, I've shared my income on my blog. I'm switching to sharing it here, since I'm trying to reach educators with my blog now. Overall, 2013 was a great year. 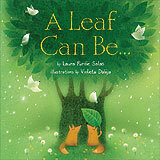 A LEAF CAN BE... got lots of lovely recognition, and I'm starting to work my way in to the world of educators and feel comfortable there, and I think that's where I need to be to promote my picture books and poetry. Here's the breakdown of what I earned in 2013. Web Work: I used to update webpages through the Children's Literature Network. In 2013, this accounted for $2,100 of my income. My work with CLN has come to an end, as the Network itself is dissolving in the next year. Although it wasn't a big source of income for me, I will really miss working with the CLN founders and meeting so many wonderful writers through my web work. Trade Book Sales: My trade sales totaled $8,944. That's almost double my 2012 number. I'm especially excited about this because my goal is to do more trade books and fewer work-for-hire projects. This includes anthology payments/royalties, advances for two forthcoming picture books, and royalties on A LEAF CAN BE... and BOOKSPEAK!, my two trade books that are in print. Assessment: $5,340. I did loads of assessment writing in 2013. I mostly write poetry and nonfiction passages, though in 2013, I also did some fiction and some item-writing, too. Assessment writing is very different from writing for magazines, even though the length might be similar. I'm thinking of writing a how-to ebook for writers interested in this area. Sadly, with standardized assessments multiplying constantly, the demand for good, dependable writers in this area seems to be growing. Teaching/Speaking: $4,238. I had a great time speaking last year. 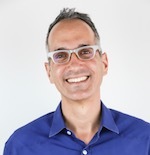 I spoke at a couple of university children's literature conferences, the Minnesota Library Association annual conference, the Loft Festival of Children's Literature, and a few library events. It's awesome connecting with teachers and librarians, and I'm hoping to do more of this! School Visits: $11,553. Woohoo! That was 19 or 20 days of school visits or young authors conferences. I don't have tons lined up for 2014, though, and I'm wondering what to do to promote my visits more. Many writers at about my level of publishing history are charging $1,000+ per day, and they're getting it. I charge $680 per day, but when my rate was higher, I didn't book as much. Not sure if it's because Minnesota has SO MANY wonderful children's writers, many of whom do school visits, or whether it's my lack of name recognition. Another area I need to figure out this year! Mentors for Rent: $2,206. This is the hourly writers' mentoring business I run with Lisa Bullard. It's another income stream that is small but brings a lot of satisfaction. We've had several clients get publishing contracts (both with trade publishers and educational publishers) this past year, which is wonderful. We have a new ebook just out (see below). Print version of Writing for the Educational Market: $963. 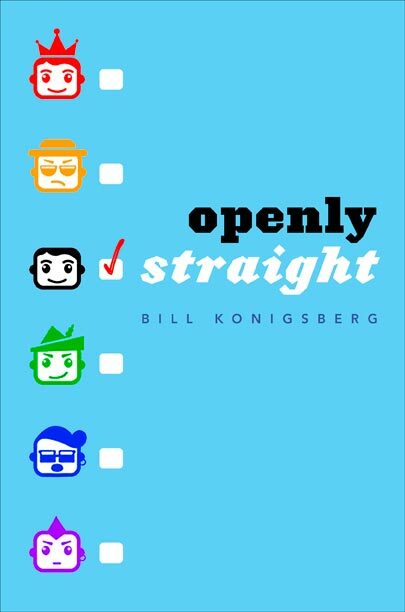 Even though the Kindle version is only $9.95, I still sell some of the print version. I get great feedback on it, and there's really no other comprehensive guide to this market. So, this book keeps chugging along. Copyediting: $6,312. This is a new category for me. I've done a bit of copyediting on and off, since I have newspaper copyediting experience. Last year, I did a huge copyediting project for a book packager. It was stressful at times, but also really interesting, since it was a literacy curriculum for another country. I learned so much! I don't have steady copyediting clients, though this is an area of income I could probably grow if I put my mind to it. NOTE: This is gross income. This doesn't include any of my own expenses-travel, promotion, office supplies, etc. nor the self-employment or sales taxes I paid. P.S. Please Share this issue of the newsletter with other writers you know if you think this info might be useful to them. They will not be automagically subscribed or anything like that. You can find out more about Laura Purdie Salas at her online home, and you can sign up for her newsletter here. Gotta admit, this is a pretty cool idea! 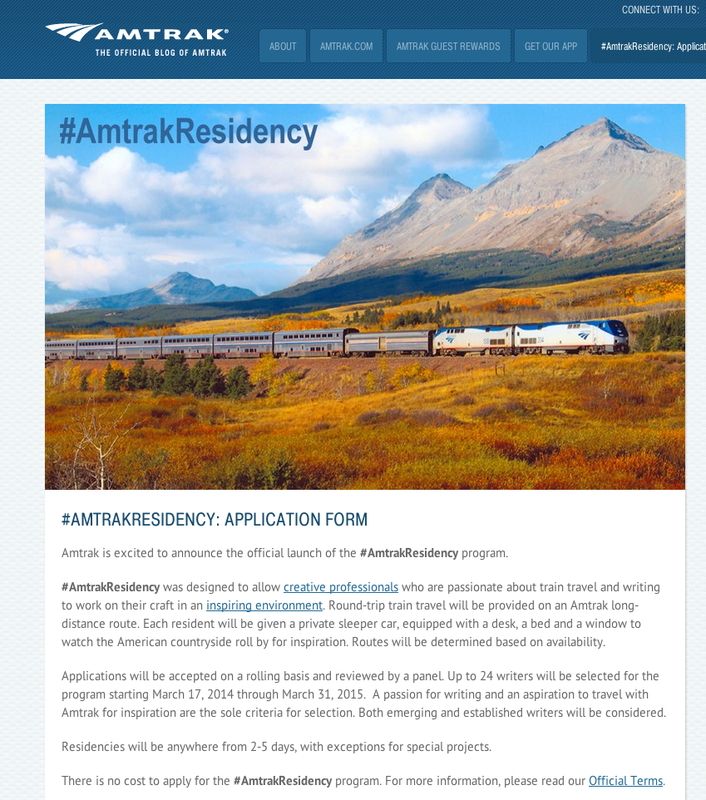 Check it out - and if you apply, let us know in comments! ps - Thanks to Lesley for the heads-up on this one! Submit YOUR Book For the SCBWI Crystal Kite Member Choice Awards! Deadline Is March 26! Each year, the SCBWI awards the Crystal Kite to outstanding PAL books published in the previous year from 15 SCBWI Divisions around the world. 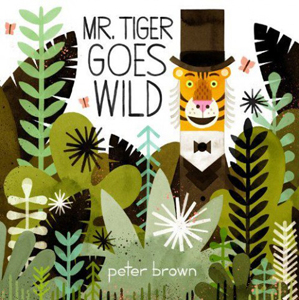 The books are chosen by the SCBWI membership who vote for the best title in their division. If you had a PAL book published in 2013, the deadline to submit your book is Wednesday March 26th. Click here to find out how to enter your book. 1. You must be a current member to nominate your book. 2. Nominated books must be a PAL book published in 2013. Click here for more information on PAL publishers. 1. Enter your book by adding it to your publications on your member profile. 2. Indicate that you would like the book entered by clicking the box. Doing any of these will immediately flag your book for potential disqualification for the Crystal Kite Awards. 4. Winners are announced in May in a press release and across all SCBWI social media and our website. Winners receive an engraved crystal kite award, an opportunity to present at a regional conference, a special sticker for their winning book, and the opportunity to submit a proposal for presentation at either our summer or winter conference. Enter your books today and then vote for your favorites! 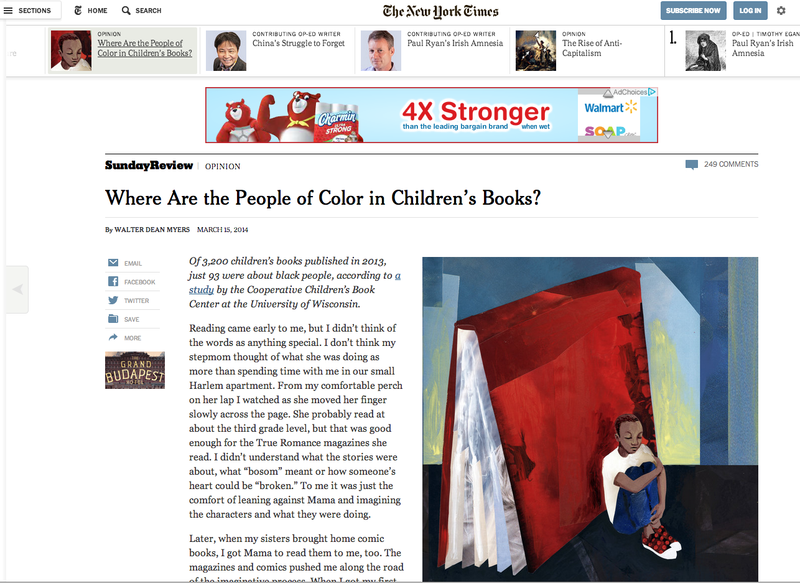 Here are two important responses for us each to consider: Walter Dean Myers' opinion piece in the New York Times is "Where Are The People Of Color In Children's Books?" "TODAY I am a writer, but I also see myself as something of a landscape artist. I paint pictures of scenes for inner-city youth that are familiar, and I people the scenes with brothers and aunts and friends they all have met. Thousands of young people have come to me saying that they love my books for some reason or the other, but I strongly suspect that what they have found in my pages is the same thing I found in “Sonny’s Blues.” They have been struck by the recognition of themselves in the story, a validation of their existence as human beings, an acknowledgment of their value by someone who understands who they are. It is the shock of recognition at its highest level." 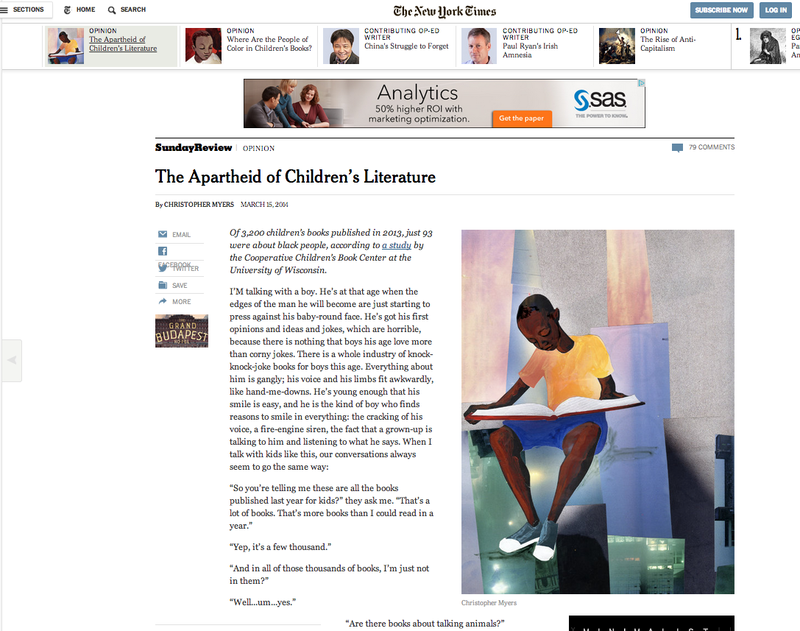 And then, Christopher Myers (Walter Dean Myers' son) responds to the same jarring statistical evidence of the lack of characters of color in children's books in his own New York Times piece, "The Apartheid of Children's Literature. Christopher writes about books as maps for a child's sense of possibility, and how, in a world where children of color aren't well represented in all types of children's literature, "The cartography we create with this literature is flawed." "The closest I can get to the orchestrator of the plot — my villain with his ferret — is The Market. Which I think is what they all point to because The Market is so comfortably intangible that no one is worried I will go knocking down any doors. The Market, I am told, just doesn’t demand this kind of book, doesn’t want book covers to look this or that way, and so the representative from (insert major bookselling company here) has asked that we have only text on the book cover because white kids won’t buy a book with a black kid on the cover — or so The Market says, despite millions of music albums that are sold in just that way." This is an important conversation to have - both externally in our industry and internally, as creators of works for children. How are WE representing the worlds of our stories? What scenes - what maps are we drawing? Good questions to ask - and then act upon. ps - My thanks to Lesley for the heads-up on these opinion pieces! Kristin Fulton has a powerful and inspiring story of her journey so far in Children's Literature. You can find out more about Kristin at her website here. What Does Your Ending Say? "If you don't know how your story ends, you don't really know what it's about." And while there's a lot of discussion about avoiding being preachy and didactic in our books for young readers, there's the opposite pitfall - giving readers an ending that teaches them, but not necessarily something we're intending. I was so disappointed in this book. It starts out well. Sara's younger brother Bernard is picked on at day camp by Big Dan, who calls him Bernadette and teases him mercilessly. Bernard takes a while to figure out what he wants to do, but ends up very happy in the sewing activity. He takes old clothing and jazzes them up with embroidery and other bits from different pieces. The other kids are impressed with his work and he makes a lot of friends, none of whom call him Bernadette anymore. 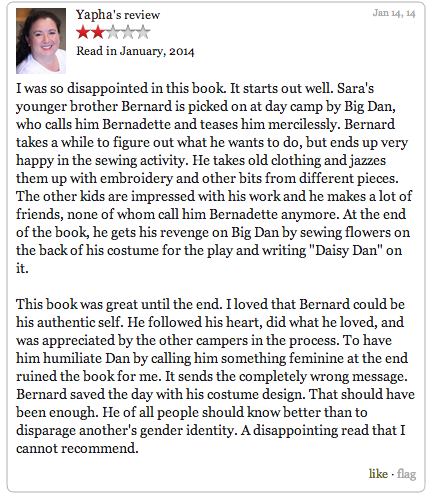 At the end of the book, he gets his revenge on Big Dan by sewing flowers on the back of his costume for the play and writing "Daisy Dan" on it. This book was great until the end. I loved that Bernard could be his authentic self. He followed his heart, did what he loved, and was appreciated by the other campers in the process. To have him humiliate Dan by calling him something feminine at the end ruined the book for me. It sends the completely wrong message. Bernard saved the day with his costume design. That should have been enough. He of all people should know better than to disparage another's gender identity. A disappointing read that I cannot recommend. I really appreciate Yapha's honesty, and her letting me share her review here. After reading the book she's discussing myself, I was also pretty taken aback at the everyone-laughs-at-the-humiliated-bully ending. What does the ending of your book say? Is it the message you're going for? And does that ending reflect what your book is really about? The 2014 Golden Kite & Sid Fleischman Humor Award Winners! 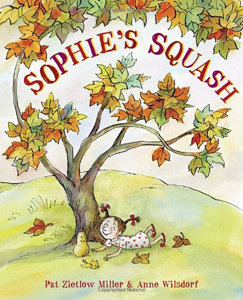 SCBWI's Golden Kite and Sid Fleischman Awards are given annually to children's books published in the preceding year. The Golden Kite Awards are to recognize excellence in children's literature. 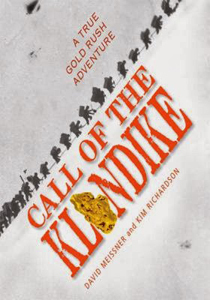 Instituted in 1973, the Golden Kite Awards are the only children’s literary award judged by a jury of peers. More than 1,000 books are entered each year. Eligible books must be written or illustrated by SCBWI members, and submitted either by publishers or individuals. 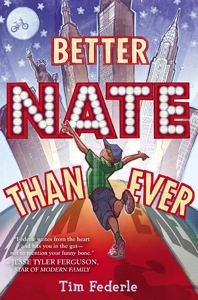 The Sid Fleischman Award goes to an author whose work "exemplifies excellence in the genre of humor, a category so often overlooked by other award committees in children's literature." The awards will be presented at the Golden Kite Luncheon during SCBWI's 42nd Annual Summer Conference in Los Angeles, CA, August 2-5, 2014. Laurel Snyder's "The VERY Best Way To Go Out Of Print"
You know that expression, When life gives you lemons, make lemonade? A friend of mine has revised that, saying instead, When life gives you lemons, make lemon meringue pie! 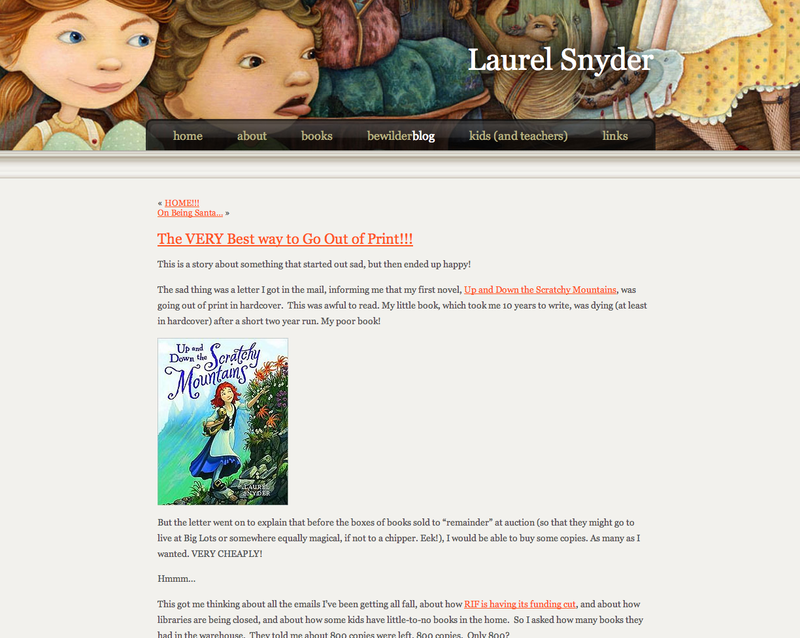 This blog post, "The VERY Best Way To Go Out Of Print" by Laurel Snyder was inspiring. It's the story of what happened when Laurel's first novel, "Up and Down the Scratchy Mountains" went out of print - and what she did then. My thanks to Laurel for sharing, and to Kate Messner, who mentioned this in her #NY14SCBWI talk.